2. Name a character from one of your novels that is most like you. Now name one least like you. Explain why? When I’m at home, no bra, baggy dress or shirt. Leggings if it’s cold. Fun slippers are required. I will write in just about anything on just about everything if you turn me loose. I even have a waterproof pad in the shower for when I want to write while shaving my legs. I’m gifted like that. Around ten screenplays and fifteen books. Some of those will NEVER see the light of day, but I’m prepping five for release over the next several months. They range from New Adult Contemporary Romance to Adult Paranormal Romance. Make many friends and listen to their stories. I used to be an international competing theatre organist! In 1999, I took first place nationally and third place worldwide. My therapist says it’s not crazy to talk to my characters…so I interview them. Then I brainstorm the story’s high points with a buddy, fill a bulletin board with pictures, and make a cheat sheet (places/people/pets). Finally, I open the computer, buckle up, and let the characters drive. Both. They can rotate weekends and holidays. Well, wait, who does dishes? I’ll take that one. I think the journey is important so I wouldn’t change much. I wish I got over the stigma of reading romance younger than I did. Why do you do this to me, Dana?! I thought we were friends. ONE PERSON?! Um…probably Ellen DeGeneres, but Josh Groban would have to be in attendance. Ellen’s life amazes me, and she is such a strong woman and role model. And Josh because he’s my future husband (wait…is my actual husband reading this?). Tacos would be on the menu. Because tacos are the best food that humans have ever created. This question implies that we don’t usually have take out and then I pick a show on Netflix (giggles). I’m all for dinner out and dancing. But like a concert or ballroom dancing. I’ve been trying to write a fairy tale for years now. One day, I will get there. Oh my goodness, this is a question that would need a page-long answer. Patti Shenberger, our late GDRWA president, took me under her wing when I joined. She introduced me to Shelly Bell, Aliza Mann, Sage Spelling, M.K Schiller, and Elizabeth Heiter, and for that, I will always be thankful. In addition to my wonderful GDRWA friends (you too, Dana! ), I’d have to say Penny Reid, although it’d be too much to explain how in a short answer. So many, many others I just don’t have room to mention. I always like to start at the beginning, so let’s say HUNTING WITCH HAZEL! However, as soon as SORRY CHARLIE hits the shelves, I’d highly recommend that one as well ;). Between the possibility of destroying the bridge and overly nosy neighbors returning from summer vacation, it was just too risky to do the spell once school started. Luckily, classes didn’t begin until next week and this place was practically a ghost town. Romi swung her legs over the edge of the bridge and stared at the completely black sky. Magic during a full moon was too dangerous, despite the stories. I preferred to use a new moon. Especially for spells I barely had enough power to cast. I set my battery powered lantern on the cobblestone wall and pulled a copper bowl from my bag. It took all my effort not to roll my eyes. The chances of this spell working at all were the same as me winning a car on The Price is Right, but I was happy to go through the motions for my sister. After all, it was our twenty-first birthday this year; and tragically, she couldn’t drink. “Well, happy early birthday,” I smiled. “You’re sure?” I triple checked as I opened my journal to the spell. My breath caught as I remembered what we both tried to forget. She was more solid than usual tonight, and I was comforted by that thought. We still weren’t sure what made her more solid some nights than others. I’m sure it was just something simple like weather or the moon cycle. But whenever she was too translucent, I panicked she’d just disappear and never come back. 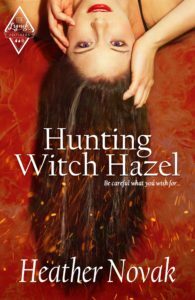 HUNTING WITCH HAZEL, Book 1 in the Lynch Brothers Series and a May 2016 release through CreateSpace Independent Publishing Platform, may be purchased from Amazon. Heather resides in Metro Detroit with the love of her life and several imaginary (and hypoallergenic) pets. 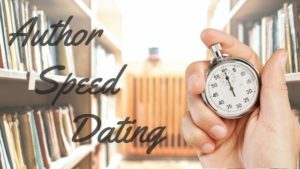 She is Vice President of Communications for her Romance Writers of America Greater Detroit chapter, coordinator for the Booksellers’ Best Awards, and the Thursday blogger for Nights of Passion blog. She strongly supports the use of sarcasm and the Oxford Comma. 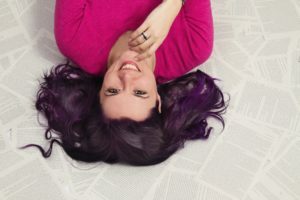 Connect with Heather through her website, www.heathernovak.net; on social-media – Twitter, Instagram and Facebook; and through her weekly romance blog, Nights of Passion. She is also a regular contributor to the Faces of Preexisting Conditions Authors Blog. Great to see Heather here!